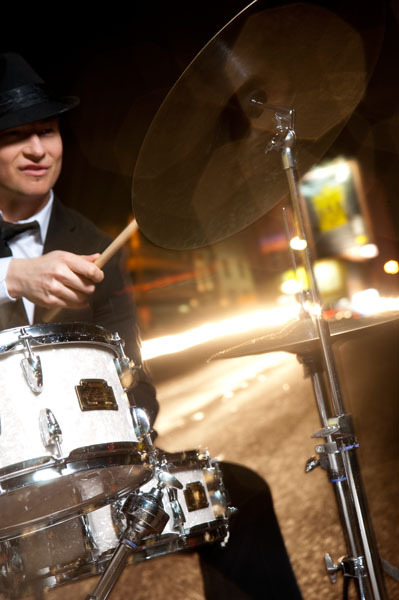 Andy Davies is a freelance drummer from Sydney, Australia, offering a well rounded playing style that covers numerous genres from Big Band, Pop, Rock, Musical Theatre, Jazz, Soul and Studio. He has a natural ability to interpret all types of stylistic direction, known in the industry as both an electrifying soloist and reliable team player. A graduate of the Sydney Conservatorium of Music with a Bachelor of Music (Jazz Studies) and a Certificate of Contemporary Music from Australian Institute of music AIM Andy’s progressive technical approach to adopting new hybrid styles enables him to support a diverse range of contemporary artists and repertoire . Andy has just returned from a professional development intensive in the USA-attending classes and solo tutorials with Peter Erskine, Dave Weckl, Tommy Igoe and JoJo Mayer. Andy’s performing and recording credits include Jeff Duff, Emma Pask, Iota, Paul Capsis, Bob Downe, John Paul Young, Rhonda Burchmore, Doug Parkinson, Tom Burlinson, Blackmarket, Greg Page (the Wiggles), Monica Trapaga, the Ed Wilson Big Band (Daly-Wilson Big Band), Sydney All Star Big Band, Danny Elliott (Mo Award winner), Frank Bennett, Geoff Harvey, John Calder, Ray Aldridge, Nathan Foley, Virginia Gay, Lucy Durack, Margie Di Ferranti, Col Nolan (Sydney Hammond organ legend) James Morrison and Ed Wilson. Musical theatre credits include The Production Company’s Boy from Oz starring Todd McKenney, Jersey Boys-Sydney season, Avenue Q-Australasian Tour (winner of five Helpmann Awards), Musical Director for Liza national tour, 2010 Helpmann Awards, Broadway artist Shoshana Bean-Adelaide Cabaret Festival, Putting It Together, Grease on the Beach, Light the Night and Trevor Ashley’s Show Queen, Little Orphan Trashley and Fat Swan. Andy has performed on TV and Radio with Frank Bennett, Ed Wilson, Jeff Duff and Tom Burlinson.